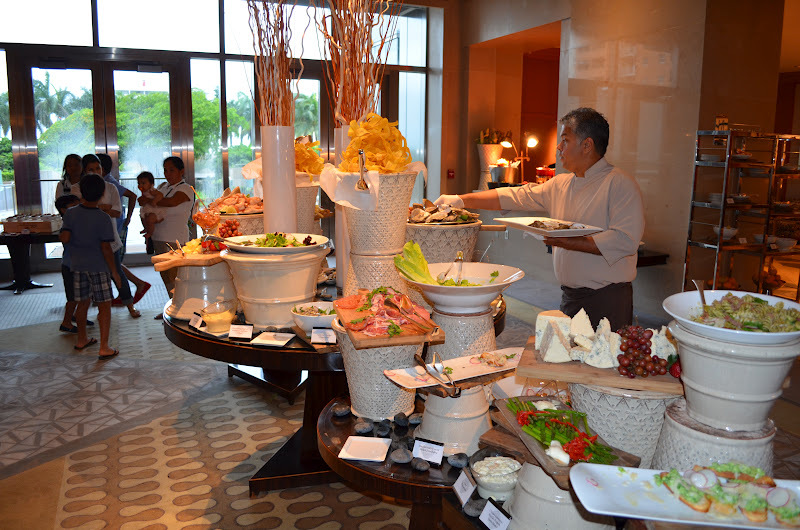 I was excited the moment we arrived; spotting the large table right in front of the entrance, where a great number of the buffet items were aesthetically placed. 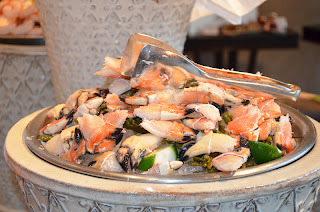 Being the seafood lover that I am, I instantaneously went to look for the Peruvian Seafood Station mentioned on their website, where I would find the shrimp, oysters, crab claws and ahi tuna tartare. I noticed there wasn't a specific station for the seafood per se, but rather platters with these items were placed on the main table. 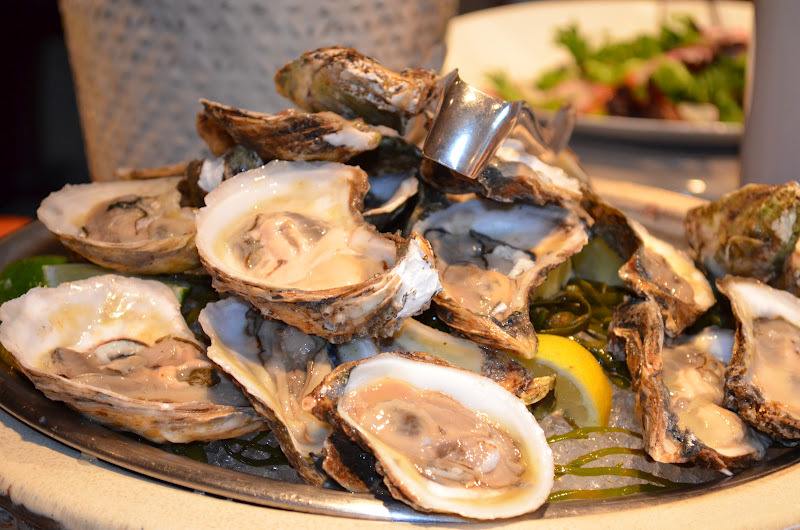 The Jumbo Shrimp and Shucked East Coast Oysters were the first to call my name. I piled some of those on my plate and went to town. They were very good. The shrimp were plump, juicy and tender and the oysters were somewhat salty with a soft texture and a slightly bitter finish. I then looked around for their Ahi Tuna Tartare, since you know me and my love for the Chicken of the Sea. Unfortunately, I never found it. I did find the crab claws but I honestly wasn't thrilled about them. They were Jonah crab claws and I am not particularly fond of those, as they are not as meaty or flavorful as their counterparts. 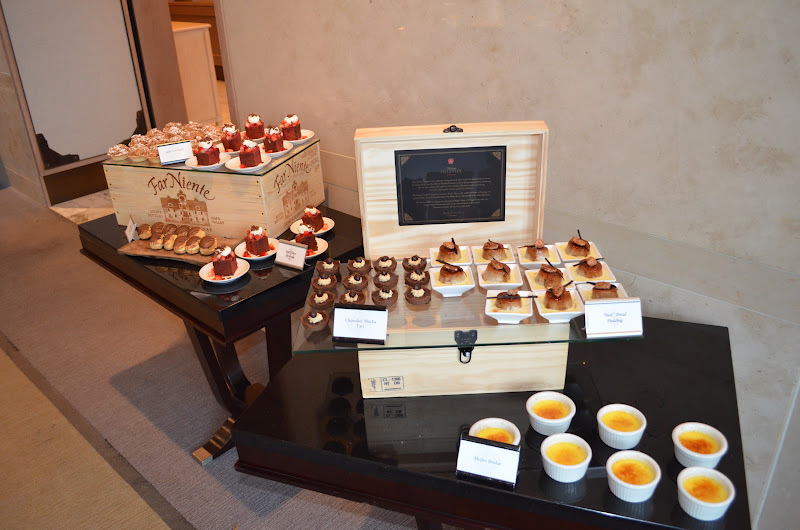 Still having a world of choices to explore, I continued sampling the items beautifully displayed on the main table. From the delicious variety of Antipasti, to the Savory Cheeses and the Sweet Pea Parmesan Bruschettas, it was a whirlwind of titillating deliciousness. 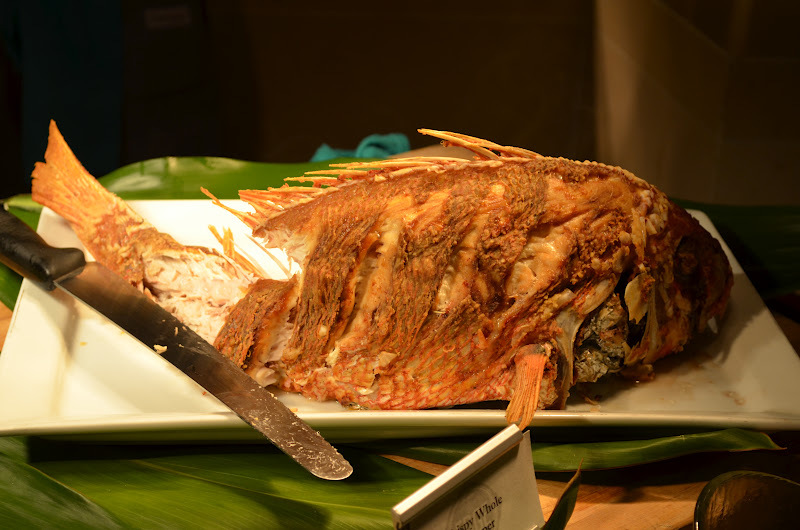 Continuing over to the Hot Food Station I picked up some Crispy Local Whole Red Snapper with Florida Mango Salsa. Scrumptious! 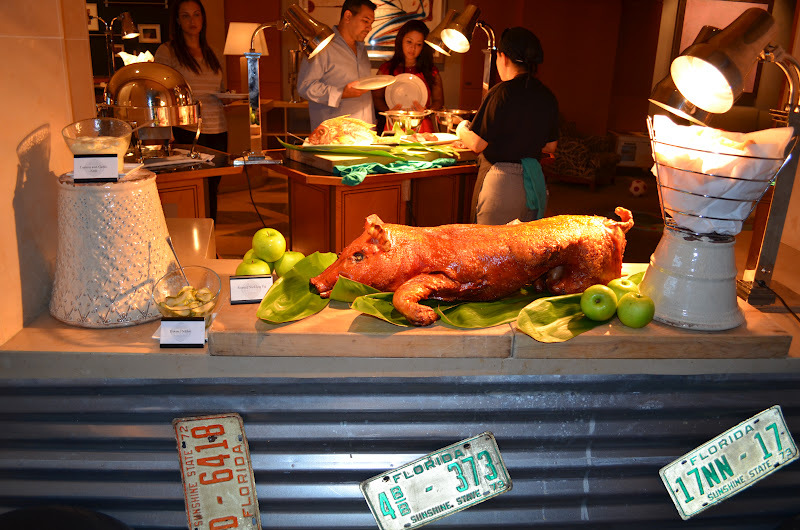 The Carving Station also offered the Chef's prime choice cut of the week, along with their famous Cutting Edge Rub. I tried some Mini EDGE Burgers with their signature House Kettle Chips, which took me back to my outstanding first visit there. What made this brunch unique to me, though, was the originality of their stations. They have two fun ones that I've never seen in any other brunch. The Viva La Mexico! station decorated like a Mexican food truck and featuring Tacos with all the fixings; and the Cuban Food Truck, showcasing....are you a ready...a Roast Suckling Pig. That was impressive! 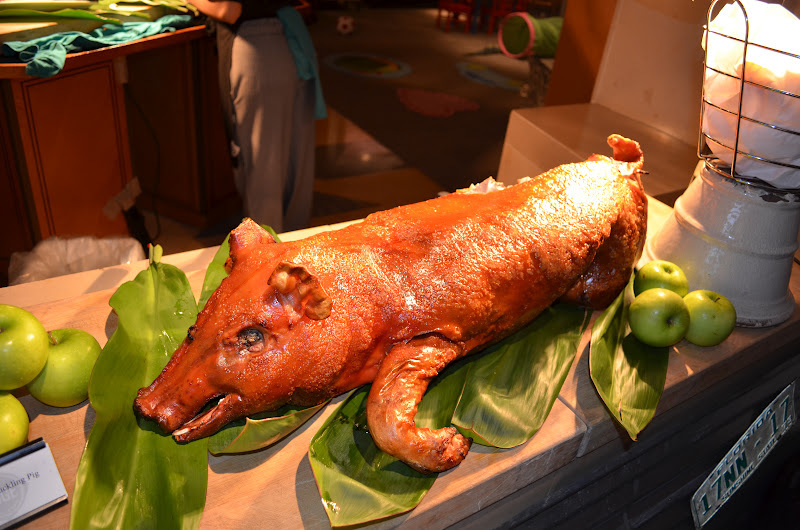 Not only because it looked awesome, but because it was perfectly roasted - and if you're Cuban or love Cuban food, you know what I mean: juicy and flavorful on the inside, with a crispy skin on the outside. I thought it was Noche Buena in July. I can tell you that when I posted the picture of the suckling pig on my Facebook page, I got a lot of responses asking me if the pig was a regular item on the Sunday Brunch menu; even from out-of-towners planning on visiting Miami. Wanting to sample more, I tried the Seafood Paella. 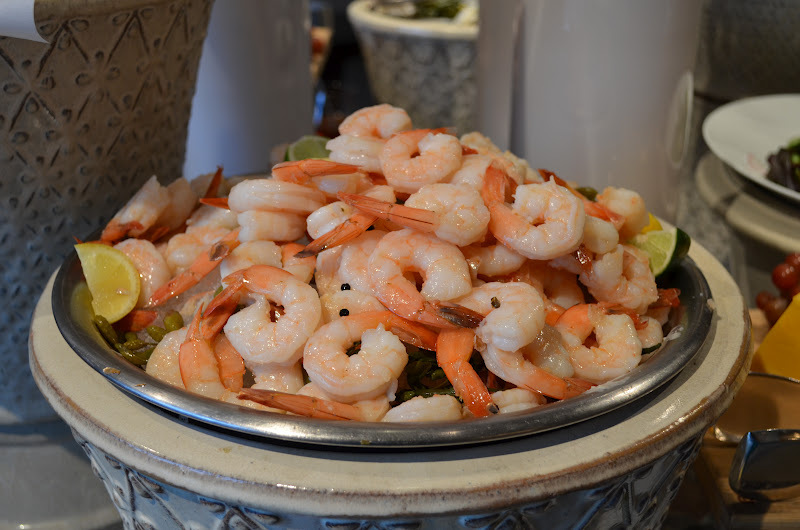 It was fantastic; standing out with its juicy layer of flavors and medley of seafood. 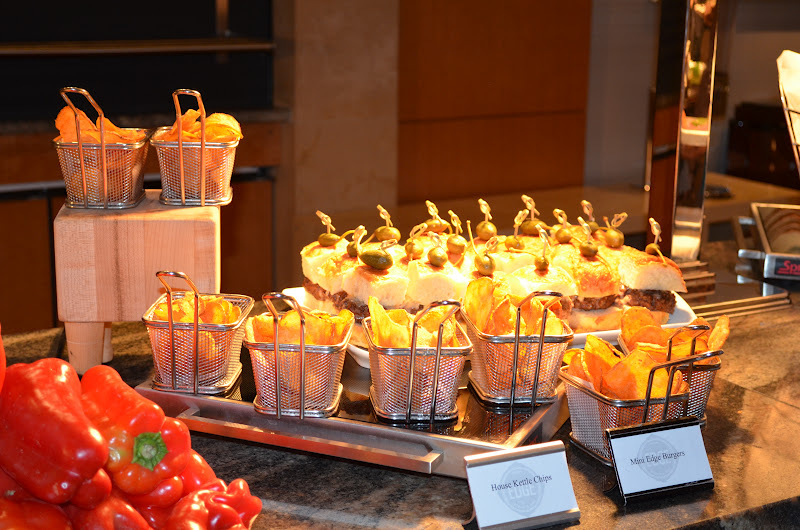 Over on the other side, chefs were preparing omelettes, and there was an array of fresh fruit to select from. By the way, they have a lot of options available for the little guys, so you don't have to leave them at home. There is a special menu for kids offering all of their favorites along with a fun station where the young (and young at heart) can grab cotton candy, frozen yogurt or lemonade. Finally, I made my way over to the desserts. I could feel the sugar rush just from looking at them. Needless to say I tried quite a few and my favorites were the Old Fashioned Chocolate Cake (Is that a surprise?) the Flan Floating Island, and the Original Tres Leches. 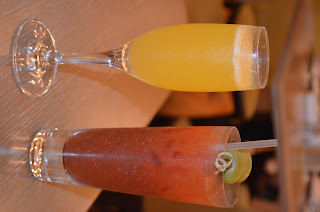 We really enjoyed trying out the brunch at EDGE Steak & Bar. Chef Aaron Brooks' talented and dedicated hand was evident in the dishes and they really went a cut above to make the presentation unique. This time around, the service wasn't as memorable as the last time but the elegant ambiance of the place still shone through. For more information on the Sunday Brunch at EDGE, you can contact them at 305-381-3190 or visit them online at http://www.edgerestaurantmiami.com/menus/sunday_brunch/.